Practices are normally one evening a week for Grades K-2 and two evenings during the week for Grades 3-12. Practices are normally 1.5 hours long. *Uniform includes skirt and shell. Cheerleaders will receive spanx, a bow, and a sweatshirt as part of the uniform, but will keep these items at the end of the season. Cheerleaders are responsible for sideline uniform pieces including white socks, black leggings, and white shoes. Uniform Distribution for Fall will be during the month of August or early September. PLEASE CLICK THROUGH THE LEFT SIDE LINKS FOR ALL OUR CHEER INFO! Welcome to the 2017 fall season of FPYC Cheerleading! 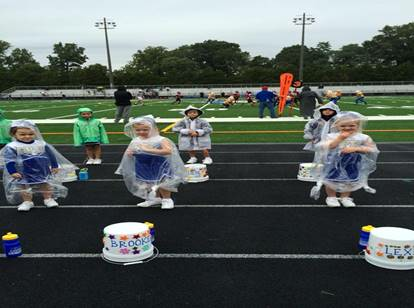 During the Fall Season (which runs from August until November) the Cheerleaders participate in Game-Day Cheerleading for the FPYC Rebels football teams. This includes learning sideline cheers and chants, sideline dances, stunts, jumps, and half-time routines. 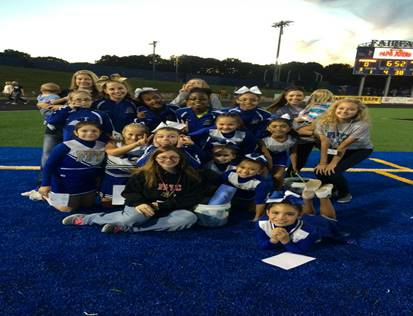 Game-day cheerleaders also get to participate in FPYC Night with the Fairfax High School Cheerleaders and end their season with Performance Day for all the area youth cheerleaders! 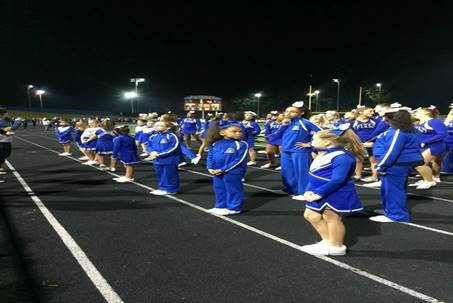 Cheerleaders are placed on squads based on their age/grade at the start of the season and their experience level. For example, if a cheerleader is on the edge of a grade cut-off and has more or less experience, we would place her on the older or younger team accordingly. You will not know which squad you are on until registration is over. REGISTRATION ONLINE is open for 2017. We will also have two walk in registration days in July 2017. There is a $125 uniform deposit this year. Uniform deposits will be due at the time of Uniform Distribution Day. All deposits are fully refunded at the end of the season during Uniform Return Day. No buying practice wear! You will need to wear gym type clothing to practices. Sweatshirts and briefs are included in your registration. All cheerleaders MUST have a short sleeve and long sleeve white t-shirt. Shoes: Each cheerleader will need to have a pair of ALL white, flat bottomed cheer type shoe. Rain Jacket: We cheer rain or shine so we highly recommend you purchase one. They are $15 each and will be sold during Uniform Distribution Day. Proof of age: A copy of a birth certificate is due during camp. Cheerleaders must be age 5 or older by August 31, 2017 (Born on or before 8/31/2012). For more information on squad placements, practices, games, etc. Please see the FAQs & Info for Parents page. We will not have as many cheer squads as football has teams, cheerleaders will rotate to different teams so that all the football players can benefit from our support! Practice will be outdoors at Draper Drive Park until the second week of FCPS School. At that time we will move practice location to Lanier Middle School. FPYC Cheer Does NOT Teach Tumbling. We work with local gyms to get a discounted rate for our cheerleaders. These discounts allow FPYC cheerleaders to attend, learn and improve their tumbling skills which are important in cheerleading.